Migration activity at Fish Point from August 16th – 31st followed a typical pattern for this time of year, with new arrivals showing up almost daily, along with increased numbers of species already present in the area. 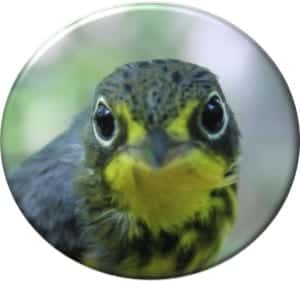 Thirty-two fall ‘firsts’ were noted over sixteen days, including seventeen warbler species, which brought the total for PIBO’s standardized coverage in August to 107 species. The jump in diversity and abundance over the summary period was evident in the netting area as well – 188 birds were banded in the last week of August compared to just sixty individuals from the 16th – 24th. A nice mix was encountered in the nets – from Ruby-throated Hummingbirds to Wood Thrushes and Baltimore Orioles – 36 species in all. Nineteen warbler species were handled and 173 banded, or 70% of the birds captured (248). It was hot and humid on August 16th, but there were a few birds on hand, with 41 species recorded in the count area. A hatch-year, male, Canada Warbler was the first bird banded this autumn and one of only a few birds captured over the first days of netting. Lots of Common Terns continued to frequent the tip – 700 on August 17th – along with 500 cormorants and 600 gulls (mostly Ring-billed). Thunderstorms on the 18th reduced coverage to just the census – it was quiet in the woods but small groups of Cedar Waxwings, Purple Martins, and Barn Swallows were seen flying south off the tip. More swallows appeared the next day, including 11 Cliff Swallows, along with two new fall arrivals – Cape May and Bay-breasted Warbler. Rain and strong west winds made for a low-key morning on August 20th and just 31 species were documented during four hours of coverage. The 21st was a bit busier, with 39 species tallied, including fall firsts for Yellow-bellied Flycatcher, Swainson’s Thrush, and Ovenbird. Brief northwest winds that night helped generate a modest fallout the next morning – 49 species were recorded, including 13 warbler species and ten new arrivals. A hatch-year Prothonotary Warbler was one of six warbler species banded in small numbers, along with a Blue-winged Warbler. The Prothonotary was possibly from the local nest that successfully fledged young this summer. A similar morning the next day saw another influx of warblers – twelve species – and a small flurry of activity on a late morning net round when 25 warblers were captured, including 14 Tennessees. Sixty Barn Swallows and 9 Blue-gray Gnatcatchers on August 24th were two of 41 species observed that day, along with a Connecticut Warbler discovered in the netting area. It rained on-and-off throughout the day on the 25th and the wind swung around again to the northwest, resulting in another buildup of migrants over the next few days. A moderately active morning on August 26th saw firsts for Osprey, Ruddy Turnstone, and Mourning Warbler, followed by a busy day on the 27th, with 55 species reported during the official coverage period, a season-high to date. Just two new species were added for the fall – Gray-cheeked Thrush and Bobolink – but there were lots of other birds present, including 12 warbler, 6 flycatcher, and 4 thrush species. Warblers dominated again the next day – 14 species were tallied – including 22 banded of ten species. Diversity dropped off the next morning, but the netting area remained active, with 44 birds of fourteen species banded in 41 net-hours (1.07 birds/net-hour), including 9 Chestnut-sided Warblers. The final two days of coverage included a rainy and somewhat uneventful morning on the 30th, followed by an overcast but busy last day of the month. Fifty-six species were noted on August 31st including fifteen warbler species, and 41 birds of fifteen species were banded. Redstarts, Magnolias, and Black-and-white Warblers were active, along with a nice variety of others. A Common Loon spotted offshore on the east side of the point was a first for the fall. The table below lists the birds captured at Fish Point from August 16th – 31st. PIBO’s next migration summary will be posted on September 18th. © 2019 The Pelee Island Bird Observatory. Site by Multibeat.